No, the Eiffel Tower was not one of my new discoveries in Paris. I just liked the photo. But just as I’m discovering so many new places in Amsterdam this weekend, I also always find something new when I’m in Paris. Despite the rain, I loved walking around the city with my camera. I already showed you some in my video, but here’s my list of places you should definitely check out on your next trip to Paris. There were two concept stores I wanted to see in Paris. The first one – Colette – has been around for a long time, but for some reason I never went in. Well, don’t bother. It’s crazy busy and yes, they have nice things, but I didn’t really get what’s so special about it. The second one however, is one you definitely don’t want to miss: Merci. What an amazing store! And not just because of that cute little red car parked in front. And when you go, don’t forget to have a drink or lunch at their Used Book Café. 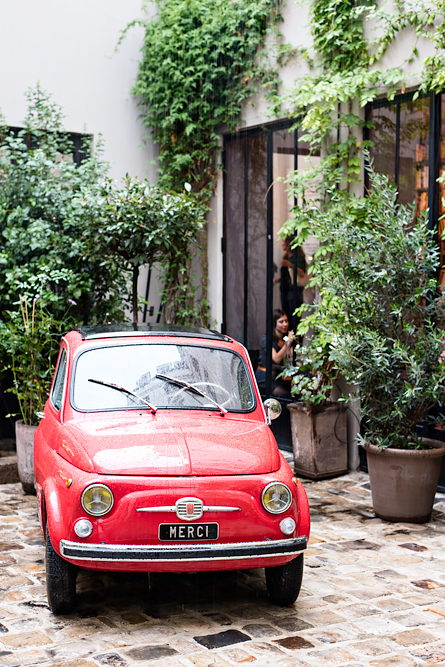 Close to Colette is the first outdoor café in Paris: Honor. Nice idea, but not when it rains… So when it finally stopped raining for a couple of minutes, I decided it was time for a little coffee break. These days there are so many independent coffee shops opening up in Paris. 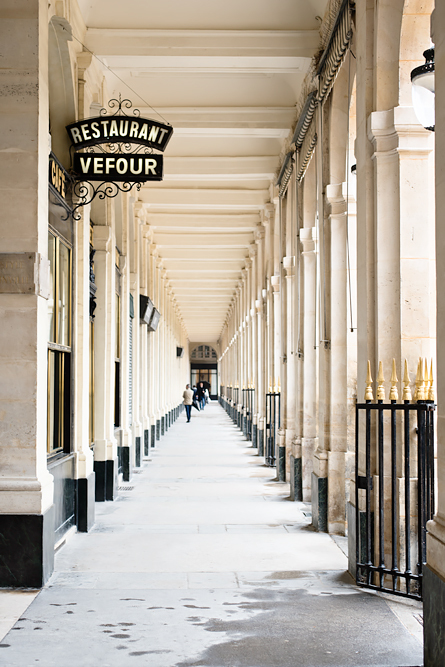 Honor is located in a cute little courtyard just off the expensive shopping street Rue de Faubourg Saint-Honoré. When I was living in Paris I used to shop at Galeries Lafayette all the time. Well, whenever my student budget allowed it. But I had never been all the way up to their rooftop terrace on the 7th floor. If you’re looking for a place to get a – free – nice view over the city including the Eiffel Tower, then this is it. In this city you never have to look very far when you’re in the mood for something sweet. But that doesn’t mean that some do it better than others. Liberté is worth checking out if you’re already in the trendy 10th arrondissement. The bakery looks super stylish, with marble counters and concrete floors. And the cakes don’t only look gorgeous (impossible to pick one) but also taste incredible. I have no idea why I’d never been here before, but what a great museum! It’s not one building but more a group of museums, and you’re paying an entrance fee per museum. I went to see two: Galéries d’anatomie comparée et de paléontologie and Grande galerie de l’évolution. I especially loved the first one. It’s like a stampede of animal skeletons! Nothing I’ve ever seen before. I had a quick lunch and a delicious cup of coffee at Ob-La-Di in the Marais, after seeing so many pretty pictures of their iced coffee on Instagram. With Australian baristas and avocado toast on the menu it doesn’t feel very French or Parisian, but I loved it. It’s quite small so you’re lucky if you can get a seat. I didn’t do a lot of shopping this weekend (who has time with such an enormous to-do list). And if I did, it wouldn’t be at Dior or Chanel. But even if you’re not looking for luxury brands, this elegant passage in the 8th arrondissement is worth a little detour. Again, it didn’t look typical Parisian, but more like something in the south of France. I even saw some sunshine while walking through, so it could have fooled me. I’m not a big fan of eating by myself when traveling alone. Especially at dinner time. But Season in the Marais was great. They’re open all day, and it’s something between a coffee shop and bistro, which made it easy to sit down with a book and order some food. Their menu is all about healthy food, like the quinoa salad: amazing! I must admit that this ‘discovery’ (since 1761…) has more to do with the store front than anything else. Although apparently they’re famous for their waffles, so it’s also worth going in. There are pretty store fronts all over Paris, but this one in the Marais was my favorite. I’m almost ashamed to include this in my list, since this art work by Daniel Buren has been part of the inner courtyard of the Palais Royal since the eighties. And I’ve been so close so many times, but this was the first time I actually got to see it. Not sure why I missed it before, because it’s such a cool part of Paris. And when you go, don’t miss Café Kitsuné next door. Address: 8 Rue de Montpensier, 75001 Paris. © 2019 Urban Pixxels|ProPhoto Photo Blog|Design by Northfolk & Co.